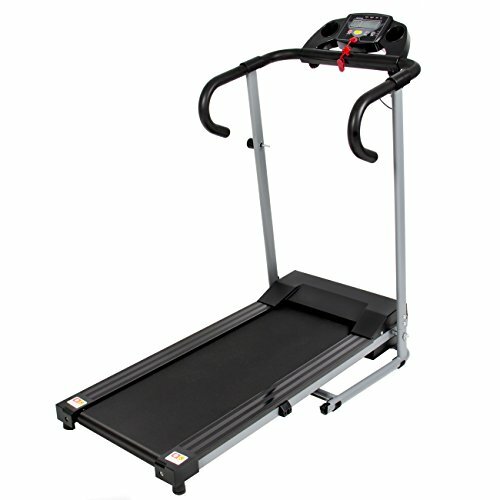 Best Choice Products presents this Brand new foldable Treadmill. If you have little time to go the gym, go running, or are prevented from running due to bad weather, this is the solution. With this Treadmill, your home is your gymnasium that will help you stay in shape. It features a multi-function display so you can track your progress, as well as a 500W motor, making it very sturdy, and can be folded manually. We purchase our products directly from the manufacturer, so you know you’re getting the best prices possible.. new product with factory packaging (not used or refurbished). features: heavy-duty construction. Multi-function LED display. Led mode: scan, speed, distance and calories. Foam handrails for safety, comfort, and balance. Safety guaranteed: easy to reach emergency stop switch. Home exercise, portable and convenience. Folding design for easy storage. Extremely low noise motor. Wheels for easy mobility. Specifications: 250 lb weight limit. Color: black. Rated power: 500W. Led display screen: speed/distance/time/calories/scan. Rated voltage: 110V. Rated frequency: 60Hz. Runway size: 39.75 x 13.5 . Overall dimensions: 47 (L) x 24 (W) x 46.5 (H). folded dimensions: 50 x 24 x 19 . Ctn size: 51 x 26 x 11.50 . Weight of package: 53 lbs. 1pc/1Ctn. Material: frame: heavy-duty steel. Control panel: ABS. Handrail: foam. Running belt: PVC. Package includes: (1) Treadmill. (1) user’s manual. (1) power line. Please note: our digital Images are as accurate as possible. However, different monitors may cause colors to Vary slightly. Some of our items are handcrafted and/or hand finished. Color can Vary and slight imperfections in the metal work are normal and considered evidence of the hand-finishing process, which adds character and Authenticity to those items.